When you sail with us, you'll immediately see what makes us different. From checking in to setting sail to returning safe and sound, we strive to provide an incredible experience for every single person who climbs aboard. Our professional, certified, and fun crew goes the extra mile to ensure we provide 5-star service on every sail. Whether you are looking for an action-packed snorkel adventure, craving a relaxing afternoon cruise soaking the warm Hawaiian sun while lounging on the nets or maybe make some new friends while marveling at a gorgeous sunset on our all-inclusive Sunset Cruise. Whatever you are in to, we can accommodate with plenty of Aloha to go around. 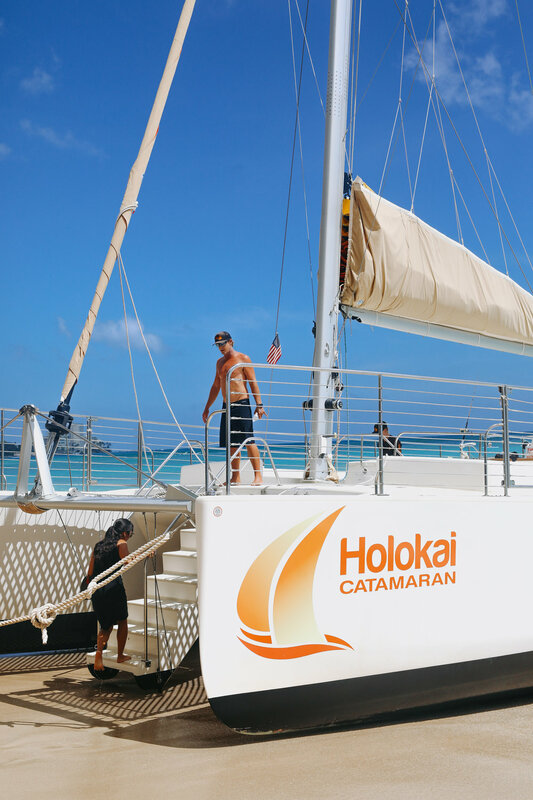 The Holokai is a beautiful, custom-designed, handcrafted 49 passenger beach catamaran.She was commissioned and splashed in 2015 making her the newest catamaran on the beautiful beaches of Waikiki. Holokai is equipped with spacious seating, netted splash area, Bluetooth sound system and a clean and comfortable bathroom. Our professional, fun and accommodating captains and crew are on hand to provide 5-star service and the most memorable experience on the waters of Waikiki! We have a bar on board with alcoholic and non-alcoholic beverages. Our beverages include: juice, water, soda; domestic beers: Budweiser and Bud Light; a variety of premium craft beers from Maui Brewing Company; a pinot grigio wine; a champagne; and our house cocktail the famous "Holokai Hooch" consisting of: passion orange guava juice, peach schnapps, and dark Hawaiian rum, a favorite with all our guests! Holokai is owned by a dynamic husband and wife team. Rich and Soo Stover are active community members who regularly participate in local action teams, community planning, charity and give back oriented initiatives. Even with full schedules, they prioritize time to run a tight ship of a business, take care of their crew, be parents and still find time to go surfing. Their passion and commitment to the community, their business, the environment and the Holokai ohana (family) are visible in all aspects of Holokai Catamaran. What better way to spend any special event, than on the water on your own private charter! Whether you're celebrating a birthday, anniversary, graduation, family reunion, wedding or just a way to spend the day - let us help you create memories and an experience of a lifetime! Feel free to enjoy an all-inclusive package for any of our sails with catering options and custom bar selections. We’ve created “highlight of our trip” team building, bonding, leadership sessions and free day experiences for small businesses as well as Fortune 500 executive teams from ranging Apple, Universal Studios, ReMax, UFC, Army Rangers, Outrigger Resorts and Royal Hawaiian Resorts to name a few. Our crew specializes in helping to create the dynamic for any occasion. Pricing for private charters in available upon request. Can't get on the boat? Cruise with us on Instagram!